On this date in 1946, my mom and dad got married! My dad has been gone many years, but we still think about him and miss him. This morning Susan and I went first to the Italian Gardens, which seem to be at the northern end of the dividing line between Hyde Park and Kensington Gardens, where there are small ponds and a pretty little stone building and where a couple of swans hang out. This is quite near the hotel. 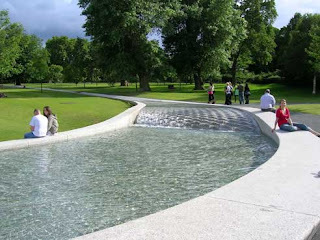 Then we angled on down through Hyde Park, sort of following the curve of the waterway--I guess it's kind of a fake river--across the park and down to Knightsbridge Road on the southside. Then we turned toward the Wellington Monument, which is in a small park which is basically surrounded by a traffic circle. 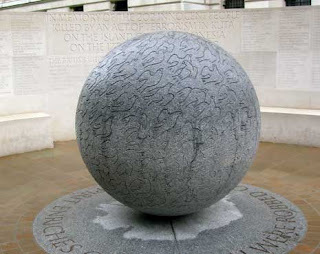 This is where the New Zealand monument and other monuments related to the military are located also. 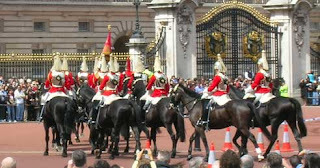 By the time we reached the front of Buckingham Palace, it was about 11, and the Changing of the Guard is scheduled for 11:30, so we stayed there to watch the first part of it. If I understand correctly what happens there, we saw the entrance of the new guard for the day (or shift, or whatever), but didn't hang around for the exit of the previous guard which apparently takes place about 30 minutes later after some kind of rigamarole inside the gates which we were really too far away to see. There were a lot of tourists there. There is also motor traffic coming through right in front of the Palace and around the Queen Victoria Memorial which also seems to function as the center of a traffic circle. So they stop traffic for a few minutes while one portion of the Guard comes in; then traffic flows again; then they stop some more traffic for another section of the Guard to come in; then some guys come through on horses; and then they all get inside the gates, I think, and then after whatever it is that happens in there, the guys getting relieved come out and march away. 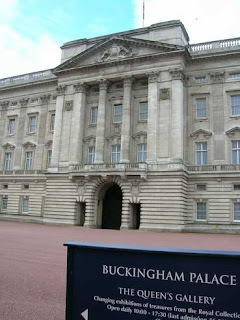 The Queen's flag was flying over the Palace which means that she was in residence there today. Susan got a photo of that, but I didn't. 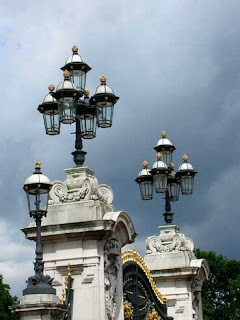 This is my "arty" photo of the day--a close-up of some of the lamps at one of the Palace gates, with dark storm clouds behind. After we left the Changing, we went down toward Westminster Abbey and had lunch in the Methodist building there. It's some kind of conference center and has "Wesley's Cafeteria" in the basement. Susan got a mixed salad meal there: I got tea and some fries to go along with my can of tuna. And--this is important--if you come to the cafe and have something to eat or drink, you can also use the restroom for free! The public restrooms across the street--between the Methodist building and the Abbey--cost 50 pence (about a dollar) to use. Susan was pretty wowed by the Abbey too, and I was pleased to visit it again. Such a beautiful beautiful building. After our visit there, we went into the gift shop for a little browsing (Susan found some Lewis coat of arms magnets for her brothers and dad) and I stumbled across a little pamphlet-style book that lists the people who are buried or have memorial plaques in the Abbey. I found that Thomas Hardy's ashes are buried there, but his heart was removed from his body before he was cremated, and his heart is buried in Dorset. He is next to Dickens. We roamed on down by the Houses of Parliament and Rodin's Burghers of Calais, the monument celebrating the abolition of slavery, and down to the Tate Britain. Susan discovered that she rather likes the portraits of John Singer Sargent, and I got to look at Edward Burne-Jones's paintings again, as well as a bunch of the Turner paintings. We found a Starbuck's with functioning wifi, so I could catch up on yesterday's email and get a Travel Log posting done. It was a big Starbuck's, with a very large basement full of tables and chairs. And very noisy. I didn't stay online as long as I might--I didn't check for comments at Travel Log--or even look to see if today's posting looked all right, because I was by then "flagging", as I usually say. Besides the fact that we had had a very long day, London has gotten to me. Whether it's how wet and chilly it's been, or if it's just the enormous amount of plant life, I've begun a sinus meltdown. Sigh. And believe me--you can look in half a dozen stores in the London megalopolis before you find a simple roll of cherry drops to soothe a sore throat! I didn't want menthol or eucalyptus or anything to upset my stomach--just cherry-flavored sugar! Apparently Life-Savers don't exist in England. Finally I found Bassett's Cherry Drops in a little shop called "Food & News". Pleased me mightily. Signing off with a sore throat and looking toward a probably restless night. . . .
At some point during the night, my sinus meltdown shifted into phase three. The raw throat mostly quits at that point, and instead I get a kind of hoarseness and tickly throat which is much less painful. I always like moving from phase two to phase three. Here's a complaint, which may also be a warning suggestion. Both yesterday and today Susan and I bought "one-day passes", good for as many bus rides as you want, because a single bus ride is 2 pounds, and the one-day pass is "only" 3 pounds 50 pence. In our case, it hasn't been a bargain either day. Each day we only got one real ride out of the pass, our first of the day. Today's situation was especially annoying: we waited while several buses of various numbers passed by until we finally got one we could use, and then we got a driver who apparently didn't know where he was going. Twice he stopped at bus stops, got off the bus, and--as far as we could tell--either asked another bus employee what to do or just looked at the bus map to see what he was supposed to do. When he got back on the bus the first time, one of the other passengers was telling him how to get back to where he needed to be to get us on track again. After about 20 minutes, we had gone maybe a quarter-mile. So we got off the bus and tried to catch another one. Didn't work out, and we ended up walking back to the hotel. Really annoying. Somehow on my first visit I missed the Rosetta Stone, although I must have walked right past it. Probably it was surrounded by a crowd, my eye was caught by other Egyptian artifacts more easily spotted, and I didn't even notice what I had done. The Rosetta Stone is the big piece of rock from about 200 BC which allowed scholars to begin to decode Egyptian hieroglyphics. It's an inscription from one of the Ptolemies (the Greek "pharaohs" of Egypt in the centuries after the death of Alexander the Great: the last was Cleopatra), which is given in three forms--Egyptian hieroglyphs, Egyptian demotic (another form of Egyptian writing) and ancient Greek. It was found in 1799 by the French forces which had invaded Egypt the previous year. Since scholars could easily read the Greek, they started working from the Greek to get to the Egyptian. A French guy named Champollion finally cracked it in 1822 or so. This arm and hand are kept next to a monumental head of Amenhotep, though I don't know if they actually belonged to the same statue once upon a time. Amenhotep III was an immensely wealthy pharaoh whose predecessors had engaged in a lot of military campaigns and created the "Egyptian empire". After his father died young, Amenhotep became pharaoh as a boy and reigned for almost 40 years, during which time he mostly built things and spent money. 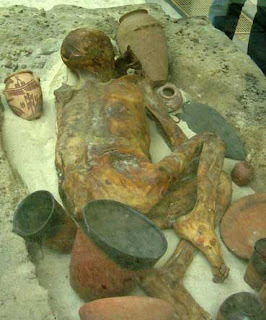 He was also probably either the father or grandfather of Tutankhamen, "King Tut". Scholars still disagree about that issue. The boy in the background right of this photo may give you some idea of the size of this Egyptian falcon--though the boy is back a distance. 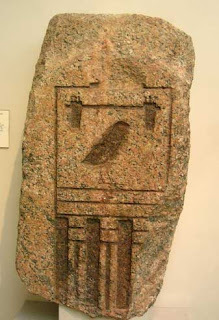 The falcon was normally associated with the god Horus, who was the son of Ra the sun-god. The reigning pharaoh was also considered to be Horus. 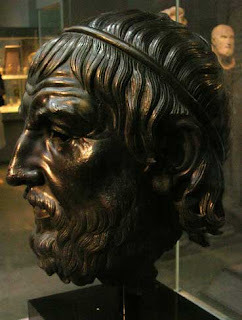 While the relief carvings from the Parthenon may be the most noted Greek sculptures in the Museum, today I offer you this bronze head, once thought to be Homer, but now assumed to be the dramatist Sophocles, who wrote the dramas about Oedipus the King. After leaving the Museum, we wandered along Great Russell Street for a bit. Susan went into a souvenir shop to look for some gifts and I visited a bookseller specializing in nineteenth century authors. I didn't buy anything (I am after all scheduled to visit the "book town" Hay-on-Wye, week after next), but saw some nice items: a really nice copy of cantos XII-XIV of Lord Byron's Don Juan as well as copies of some of his other books which had lost their covers. A little further down the street we had lunch at a little diner which had "jacket potatoes" (baked potatoes), sandwiches and Italian ice cream. I had a jacket potato with butter; Susan had a ham-and-cheese sandwich. And then it was on to the National Gallery to see Leonardo, Velázquez, Caravaggio, Turner and other artists. Then, on our way back to Oxford Street (and our failed bus ride to the hotel), I went into the foreign language bookstore to buy a novel by a South American author while Susan browsed a "vintage clothing" store next door. Later we had the excitement of going to a laundromat to wash clothes before changing hotels tomorrow to get ready for the bus tour. As in Malta, laundry is expensive, as much as 3 pounds 60 pence (more than $7) to wash one double-load of clothes; 2 to 3 pounds to run a dryer for thirty minutes! How do the locals afford to wash their clothes? I don't get it. And by the time all this was over, I didn't have the energy to try to get to Starbuck's and post yesterday's log or answer your email. But I did have the energy to shower up. Have I mentioned this bathroom? The double room is substantially larger than the single room--maybe three times as big, maybe a little more--but the bathroom is essentially the same, although less conveniently arranged. Imagine a room which is, at the entrance, barely wider than the doorway itself. As you step in, the sink is on your right. Its back set back just a few inches from the door-frame; its front sticks out into into your line of passage as you enter. Just past the sink, directly in front of you is the toilet. Here the bathroom widens out: the shower stall is to the right of the toilet, in a recess past the sink. But the shower stall is also on a platform about 10-12 inches higher than the rest of the floor. To get into it, you have to turn right, just past the sink, and step up between the sink and the toilet, both of which are just a few inches to either side of you. Getting out is a little trickier, of course, because you are wet as you step down to the main floor. There is no room to speak of to dry off, without bumping into the wall or the sink, just as it's virtually impossible to take a shower without repeatedly banging into the (plexi? )glass sides of the shower stall, which is absolutely no more than 3 feet to a side, and maybe a few inches less. Believe it or not, it's less convenient to use than the bathroom in my Casita travel trailer was--and that travel trailer was under one hundred square feet large! If you don't hear from me (email or Travel Log) for the next week, it's because I'm on a bus tour of England, Wales and Ireland and can't get Internet access! The Tate Gallery, at some point (I don't know when), split into two galleries: the Tate Britain Gallery and the Tate Modern Gallery. I learned this after arriving at the Tate Britain Gallery this morning. The Tate Britain is devoted to British art (thus the name), and I bet you can guess what the Tate Modern is devoted to. There is of course some overlap of artists since some British artists are modern artists. Hehehe. I walked from the hotel to the Tate this morning. There was some sunshine, but it was quite chilly: in the 50s, I suppose. In fact, it might not have gotten above 60 degrees all day. But it didn't rain--yippee! 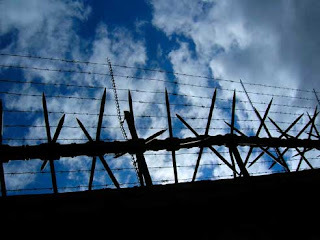 And not too far from there, I snapped this photo, looking up at the barbed wire and long nailish barbs at the top of the wall along this backside of the Buckingham Palace grounds. This same sort of barbing protects the wall along Constitution Hill Road too. After another block or so, I got around to Vauxhall Bridge Road which leads to--you guessed it!--Vauxhall Bridge, one of many "London" bridges which cross the Thames River. I turned down a road called John Islip a bit before reaching Millbank Road, which runs along the Thames. From John Islip, one can reach the side entrance to the Tate Britain Gallery. My first goal--once I got a map of the museum (and had a visit to the men's room)--was Room 14, where the Pre-Raphaelite paintings are kept. Apparently Edward Burne-Jones, whose work I often like and whom I earlier referred to as an associate of Dante Gabriel Rossetti, one of the founders of the Pre-Raphaelite Brotherhood, isn't really a Pre-Raphaelite: his paintings at the Tate are in another room. But in getting there I came to a contemporary exhibit, laid out in a long connecting hallway, which deals with British protests against the war in Iraq and features some very disturbing imagery. I wonder if an American public museum could show such work without serious controversy erupting. Perhaps the most famous paintings in the Tate Pre-Raphaelite collection are two by John (Something) Millais. One is Ophelia, the famous painting of Shakespeare's Ophelia (from Hamlet) floating down the river as she dies. The other is Christ in the Home of His Parents, which shows Jesus as a teenager working with Joseph in the carpentry shop while other members of the family are engaged in various activities as well. The Tate Britain also has several works by artist and poet William Blake, including some copies of his illuminated (illustrated) books of poetry, among them Songs of Innocence and Experience. Cabinets display some of the books by other authors which Blake made engraved illustrations for, all within the context of the British abolition-of-slavery movement. 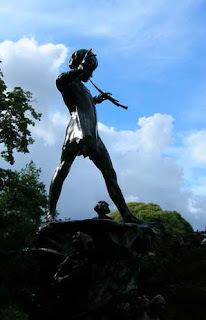 There is a photographic blow-up of Blake's poem "The Little Black Boy", as well as the actual poem itself which takes up two pages in the Songs. The museum exhibits the first page from "Copy A" and the second from (I think) "Copy T". These copies were made many years apart, I presume because of the time and expense involved in making these books. Blake did not get wealthy as either artist or poet. Lou Ann, I imagine, could tell us exactly what the broader situation was for Blake. The Tate Britain has a really large collection of works by JMW Turner: oils, watercolors, finished paintings, unfinished paintings, sketches. I really enjoyed seeing some of his drawings of buildings, especially one of Durham Cathedral which he did as a very young man. And some of the unfinished paintings look finished to us as "moderns" because our views of art have changed so much in the 150 years since Turner died. There are scenes of shipwreck, buildings, the English countryside, things he saw on his trips to Europe, and so forth. A real wealth of material. The "interactive" room points out that in the 18th and 19th centuries (when Turner was born and when he made his name and career) art students learned by copying earlier works, and so it provides several works along with pads of paper and pencils, so that visitors can sit down and have their own lessons, if they want to. I was tempted to do so, but was probably a bit too tired by that point. I was at the museum for about 4 hours, I guess, but I broke the time up by having lunch in the cafe. I had a can of tuna and an apple with me, so I bought a pot of tea and (what else?) a chocolate muffin to add to them. (Why is it that nowhere in the universe can anybody offer a plain muffin? Why does everything have to have fruit, nuts or chocolate in it? The cafe didn't even have plain potato chips! Okay--end of complaint from Captain Food Allergy.) I sat in a corner, ate my little lunch and read a bit. The Tate Britain cafe, by the way, gives better value on tea than the Tate Britain kiosk cafe near the side entrance or the Victoria & Albert Museum outdoor cafe does. 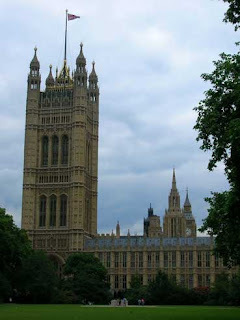 After leaving the Tate Britain I wandered up Millbank Road toward the Lambeth Bridge. 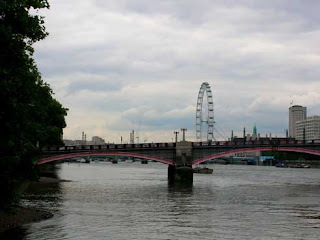 (The next bridge beyond Lambeth is the Westminster Bridge, and beyond that you hit the Waterloo Bridge, the Blackfriars Bridge, the Southwark Bridge, and then the London Bridge. I haven't made it that far yet.) Along the way I took this photo, looking down the Thames toward the Lambeth Bridge and the London Eye. Walking on north one gets this view of the Houses of Parliament. Just west of here (to the left of the photo) is Westminster Abbey, which itself faces west. 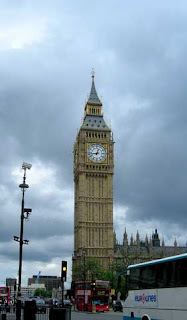 If you look carefully at the photograph, you might be able to make out part of the south clock face of Big Ben. I couldn't get more of the clock without moving under the trees, and thus losing another part of the clock! 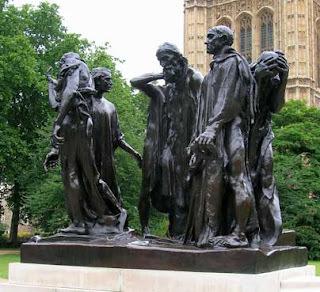 As one gets nearer to Parliament, one comes to The Burghers of Calais by Rodin. According to the story, in the fairly early years of the Hundred Years War, Edward III of England had had Calais under siege for almost a year when 6 burghers (citizens) of the French city volunteered themselves as sacrifices on behalf of their people. Edward allegedly had mercy on them. The Hundred Years War ran from something like 1338 or 1339 to 1453. Edward himself was king from 1327 to 1377 and (if I remember my English history correctly) was really more interested in architecture than war. He is buried in Westminster Abbey. Passing alongside the Abbey, I ducked into St Margaret's Church for a few minutes and got out of the wind. The church is right next to the Abbey. Then I went by the Westminster kiosk for another cup of tea. I was thirsty, and I needed something to warm me up. I held the cup with both hands for heat as I walked for the next few minutes. The tea cooled down fairly quickly and was ready for drinking. 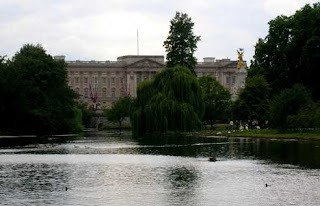 I made it to St James's Park and took this photo of Buckingham Palace from the pedestrian bridge in the park. At the same time a long line of ducks was passing under the bridge. Checking email a while later, I got a message from Susan saying that, last time she looked at the Continental Airlines information online, her flight arrival time tomorrow had been delayed. So I checked as well, and saw the same information. Looks like I won't need to leave the hotel quite as early in the morning as I had thought. What's interesting, of course, is that the time in the US, at that point, was only about noon, several hours before her flight was supposed to leave Houston, and yet they were already predicting delay because of a problem with another flight or some such nonsense. In fact, as I write this posting, Susan is probably still sitting in the airport in Houston! This morning I took the longish walk down to Victoria Station to catch the train to Gatwick. As of yesterday evening, Susan's flight arrival time had been delayed about two hours, so there was no need to be in a particular hurry to arrive. I walked through Hyde Park, taking a path I hadn't taken before. At one point I stopped and pulled out my map to figure out which direction to go next. A passerby stopped without my even asking and said, "Where are you trying to get?" Lots of nice folks here. 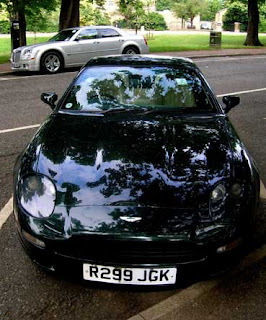 I also took this photo of an Aston Martin in the park. I thought Deron would want to see it. The ticket line at Victoria was incredibly long, so I got in the "quick ticket" line to buy the train ticket from a machine. Some kind women in line behind me helped me decide which I needed (the cheapest did just fine! ), and then I had to find a couple of other folks along the way to figure out which platform and train to get to. Victoria Station confuses me no little bit. When I got to Gatwick's North Terminal, it was about 11:30. Susan's flight, originally scheduled for a 9:55 arrival, was on the arrival board for a bit after twelve. I had a can of tuna with me, so I got a cup of tea and some chips from a little cafe at the terminal and had an early mini-lunch. After reading a while, I bought a soda and a package of croissants at Marks & Spencer to supplement lunch. Then I walked down to the arrivals area, just in case Susan had had time to come through passport control, luggage and customs by then. I looked into the WHSmith bookstore near Arrivals to see if she was there, then wandered past the Arrivals gate--and there she was, looking perhaps a little dazed, just coming through. They fed her well on the Continental flight, apparently doing everything they could to make up for the long delays in leaving the US, so she didn't feel the need for one of my croissants. In fact, she wanted only a bottle of water before we got her ticket and got on the train to Victoria Station. We left Victoria and went up to the street, catching a bus rather than "the Tube" to get back to the hotel. From the bus, you can see the view out the window--on the subway, there's nothing to see. Once we got her things put away in the hotel, she was ready to get out and look around, so we headed off up Bayswater to Oxford Street, thinking we might make the British Museum before it closed. We bought some picnic items at Sainsbury's Grocery and ate at the Marble Arch park right on the northeast corner of Hyde Park. Then, continuing on Oxford, we went into a Clark's shoe store, did some browsing at HMV (music superstore) and broke out the umbrellas repeatedly as the rain came and went. Finally we made the British Museum about 5 minutes before it closed, so we didn't go in, though Susan took some photos outside. She also photographed the plaque marking Randolph Caldecott's house, just across the street from the museum. After returning to the hotel for a short rest, we went just around the corner to a small fish-and-chips/burger place, which the desk man at the hotel recommended. Susan had fish-and-chips and a salad; I had chips only. Then we went down to Starbuck's so that I could check email and post the Travel Log, and Susan wanted to read from her London guide and have a cup of mint tea. Well, tonight the T-Mobile connection was not connecting. I suggested to the Starbuck's clerk that he could just unplug it and plug it back in and it would probably be fine, but he was adamant that Starbuck's employees don't touch the T-Mobile equipment. I tried repeatedly to connect, but the problem was clearly in their router--since I was getting a strong signal of connection to T-Mobile, but T-Mobile was not connecting to the Internet. Since there is another Starbuck's up the street, we headed up there to try to get a connection, but at that location there was no T-Mobile signal at all. Yet at both locations my computer detected numerous other wifi providers! Of course I'm not paying for those, so they were no good to me. I'll hope to pass a T-Mobile shop tomorrow so I can complain. For now, my only comment is that T-Mobile's wifi hotspots leave a lot to be desired, both here and in the US. I used Barnes & Noble's SWB/ATT wifi service for a year from 2005 to 2006. It occasionally hiccuped, but never failed to work. T-Mobile's service--good at Starbuck's and Borders Book Stores--which I used in the US for about 10 months before I left for Europe was not nearly as reliable, a B+ maybe, whereas the B&N service was right at the edge of being perfect. So there is your explanation for why you did not get a travel log posting on Wednesday! The constant wet chilly weather here has given me a sore throat, and unfortunately the weather shows no sign of improving. I'm still having great fun, but I'm not enjoying being sent back to an ugly March in Dallas! The Victoria and Albert Museum, to the south of Kensington Gardens, is across the street from the Natural History Museum and the Science Museum and just down the road from the Royal Geographic Society. Today I made it only to the V&A, but maybe I'll make one or another of the others at some point. The V&A is both an art museum and a museum about how arts and crafts get done. Finished (and sometimes unfinished) works are on display, to be sure, but they are categorized by the materials they are made of, giving the visitor a chance to compare how various artists of various times have worked in the same materials. The museum also has a large collection of plaster casts of famous art from many countries, including copies of such works as Michelangelo's David and Moses and even such large architectural works as part of the front of the church at Santiago de Compostela in Spain and the enormous column Roman emperor Trajan, so large the cast is in two pieces, the lower half and the bottom half--the whole thing together won't fit inside the museum! The first gallery I wandered into was the sculpture gallery. The museum has quite a collection of bronzes by Rodin, most famous for The Thinker (one copy of which is in St Paul de Vence in France--I blogged it earlier). 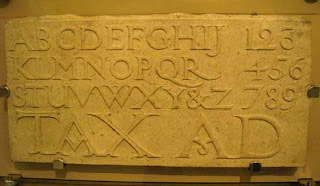 They also have work by the British artist Eric Gill who, in addition to being a sculptor, designed alphabets. This plaque features only upper case letters, and the numbers 1-9: aren't they beautiful? Do you think Samson's hair ought to be longer? The sculpture gallery overlooks a courtyard where the museum has a cafe with snacks and drinks. I was carrying a can of tuna and an apple with me, so I went out, bought a cup of tea and a muffin, and sat down for an early lunch. Before I finished it began to sprinkle, and there was a pretty good rain shower while I was in the museum. Apparently the V&A gets lots of school visits--or maybe it's just that time of the English school year. A large group of what seemed to be high school students came noisily through while I was in the sculpture gallery, and a couple of hours later, when I was leaving, a really large group of elementary students were lined up with their teachers in the foyer. One of the museum employees was sitting at his desk there with his fingers in his ears. I probably should have told him, "I know the feeling!" There is also a rather heavy, but even smaller, bronze horse for touching, and one of the display cases has a silent film, with captions, showing how the "lost-wax" process for creating bronze sculpture works. It was quite fascinating and looks rather complicated. 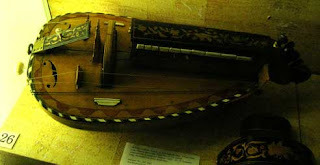 I have wanted a hurdy-gurdy ever since seeing part of Captains Courageous several years ago. In the movie Spencer Tracy plays a hurdy-gurdy and sings along. I like the sound very much, but they are not inexpensive. 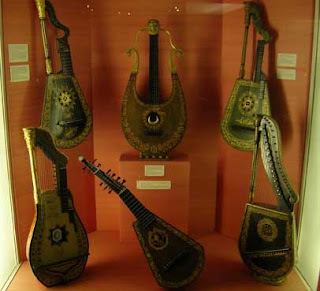 Maybe learning to play the hurdy-gurdy will be one of my "achievements" in retirement. Here is a photo of an entire case of string instruments, especially for my finger-picking friends Dave Larsen and Greg Whitfield and those great fans of heavy metal Esther Arriola and Monica Nicolai! Another of my favorite areas was 19th century painting. The museum has work by William Blake, Dante Gabriel Rossetti, John Constable, JMW Turner and--a personal favorite--Edward Burne-Jones. 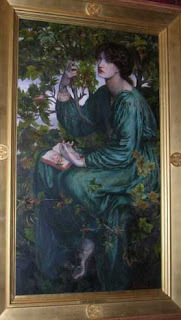 This Burne-Jones work is quite large and hangs in a stairwell. I took the photo from the side, trying to get it into the best light. It is called The Car of Love and perhaps represents how love controls or snares both men and women. This one is by Rossetti. Doesn't she have a languid, dreamy look on her face? Some of the Pre-Raphaelite painters seem to specialize in that other-worldly gaze, a much different expression than the trapped or tormented look which one often sees in Burne-Jones's subjects, even though he and Rossetti were associates. 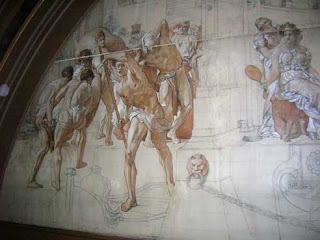 This "cartoon", also from the second half of the 19th century, also by an English artist (Leighton? 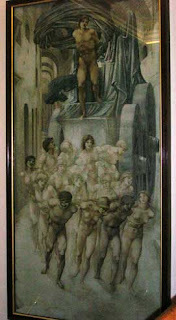 ), is a working version of the finished painting, done for the museum. This draft was rolled up in two pieces (see that line across the top third or so of the painting) and forgotten about for 100 years before it was rediscovered. The photo above shows only about the left quarter of the full work. The entire title is something like "The Arts of Prosperity In a Time of Peace". Its companion deals with the time of war, and the preparatory cartoon for it was presumed lost. X-rays revealed, however, that the war cartoon is underneath this one, which is painted on top of it! The photos I've posted here give no idea of the breadth of the collection at the V&A and there is much to see which I either didn't get to at all or just sort of walked past and glanced at. One's eyes sort of fill up after a while. There is a gallery of ironwork, for example: iron-fences, wooden window shutters with iron hinges and bindings, and so forth. There is an entire gallery of work done in silver! The place is enormous. After a second lunch--we hobbits eat frequently--I walked back down to the Oxford Street area to check out two stores I had stumbled across yesterday (actually about a block off Oxford Street). One is an independent bookstore which specializes in non-English language materials: literature as well as reference and teaching materials. So of course I had to browse the Spanish for a while. Prices seemed high to me, as most prices in the UK do. I found one book which looks quite interesting, however, and checked for it later on the bn.com website to see if it was readily available in the US. It doesn't seem to be--so I may have to buy it before I leave London: Parménides by César Aira of Argentina. The record/CD store turned out to be almost entirely classical, which I was not expecting. I browsed a little bit and heard an interesting new CD which the shopkeeper was playing, but he didn't seem to have another copy of it on sale, so maybe it is something else I will look for later. Was it still raining? Yes. Did it ever stop. Yes. After I walked back to the hotel, had my early supper, rested a bit, loaded up the laptop to go to Starbuck's for wifi, and walked almost all the way to Starbuck's. In the last block or so, bits of blue sky began to be apparent, and while I worked at Starbuck's a big chunk of the sky actually cleared. I actually walked back to the hotel from Starbuck's without needing the umbrella above my head. Can I hope for more of that tomorrow? Who knows? In parts of England it's been flooding. Let's hope that doesn't happen in London! This is so much gold (or gold-colored) surface that it reminded me of Byzantine religious icons, which used gold paint so extensively. Directly across the street from the memorial is the Royal Albert Hall where zillions of prominent performers have played over the decades, including personal favorites Cream, both before disbanding in 1968 and during their reunion concerts in 2005. From the memorial I walked along the south side of Kensington Gardens and Hyde Park, and then more or less followed the same route I had taken on Friday, going again past Buckingham Palace (where the board announced the changing of the guard tomorrow at 11:30) and then down Birdcage Walk along the south side of St James's Park. Did I mention that it was raining? It rained almost all day--with a break of an hour or so in early afternoon. The umbrella I bought Thursday evening sure got a good break-in today. The temperature might have reached 65, though it wouldn't surprise me if it didn't. I wore a t-shirt, a long-sleeved shirt and--a good deal of the time--a windbreaker. Attending services at Westminster Abbey was sort of odd, because the choir stalls create a big visual blockage, right in the center of the Abbey. I was sitting in a small section opposite the choir stalls and had to sort of look across into the transept (I think that's the word--where the long and the short axes of the church cross) where the Archbishop of Canterbury Rowan Williams stood as he preached and where communion was served. Today was a confirmation service, and several of the 10 boys who were confirmed had the kind of names one might, stereotypically, expect to find in English families, but not in American: Augustus, Raphael, Maxim, Callum and--yes, Dickens fans--Pip! (I made an effort to remember these names.) The organ was powerful, and the choir was good--though some of the music, with the high voices singing, was almost eerie. The choir sang "Panis angelicus", a song I like very much, during communion. The Archbishop preached about being good listeners and good speakers, capabilities--he said--which the Holy Spirit will help to develop in the newly confirmed. He stood at the doorway as we all left, shaking hands and greeting everyone. So I have now shaken hands with the Archbishop of Canterbury! Not far from the Abbey is the Churchill Museum (I haven't been to it), and just outside it is the memorial to those killed in the terrorist attack in Bali in 2002. 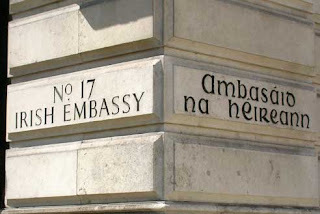 The names of British citizens are in the center of the memorial wall, but the memorial names all of the other dead as well. I went into St James's Park, just west of the museum and memorial, to find a dry bench (it was still raining, but the trees are thick and tall in the park) where I could sit down and have a can of tuna and the remainder of my morning shortbread cookie. 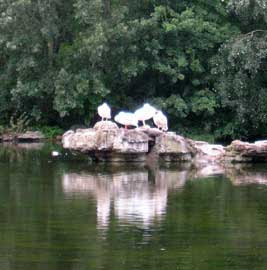 These pelicans were huddled on a big rock in the pond at the park. They didn't seem to be enjoying the chilly damp weather either. After lunch I wandered on north, past where No. 10 Downing Street is (I guess it's behind all those guarded iron gates), through the arch where the Horse Guards are, and up toward Trafalgar Square. Here there is a high high pillar with a statue of Admiral Nelson (right?) up on the top. I took a picture, but it's not really worth much. It looks like a pole with a doll on top! And just north of Trafalgar Square is the National Gallery, an enormous museum full of paintings. I did not see everything--there's far too much to concentrate on in one visit, and it may be that I'll be back here later in the week anyway. One of the nice things about the gallery is the computerized information center where you can search by artist or title of painting and find out what room it is in. The computer will also give you information on the artist and and the painting. The delights here include several Van Goghs, among them Sunflowers; quite a number of paintings by Pissarro, Cezanne and Monet (North Texans might be especially interested in his Flood Waters); and Seurat's Bathers at (I forget). There are also two Leonardos--The Madonna of the Rocks and a cartoon (a preliminary drawing) for a painting of Mary, holding Jesus and sitting on her mother's lap. The Gallery also has three paintings by Caravaggio (it's his enormous Beheading of St John the Baptist which is in the cathedral in Valletta, Malta, and in which the beheading is not yet complete). One of the paintings is the immensely repellent painting of a boy being bitten on the finger by a lizard, and another--recalling Valletta--has Salome with the head of John the Baptist. Sometimes I just strolled from room to room, watching to see what caught my eye. Today bright blues (normally skies) and dark but very detailed scenes seemed to do the trick: who knows why? Hey, it's ten o'clock, and I think it may have finally stopped raining. 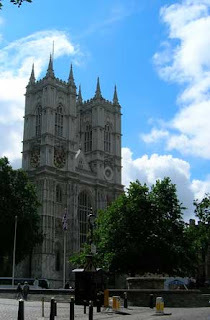 If Westminster Abbey was heaven, then today must have been at least the third or fourth heaven--maybe the seventh! While standing in line this morning to ask about getting a train ticket to Oxford for a day visit, I heard someone mention the British Museum, and I thought, "Why should I leave London to go to Oxford when I've got the British Museum to see?" So I got out of line and started walking. Along the way I stopped in at HMV Music Store and saw several CDs I wouldn't mind having, but CDs are expensive here and--to tell the truth--I can probably get most, if not all, of them from Tower.com, possibly at a lower price. But who knows? I may yet go in and plunk down some pounds sterling for a CD or two. I also visited Debenham's, a big department store, to check out the possibilities of a shoulder-bag to replace the backpack I left in Malta (deliberately). I've been feeling that I'm a little too old to be carrying a backpack around like a college student. I found a canvas bag I felt would be pretty useful but didn't buy it until later in the day, after I'd looked at other computer bags and tote-ish bags at a few other places as well. While in Debenham's I also stopped at one of their cafes and had a cup of green tea and a donut. Breakfast (5 half-slices of bread, two bowls of dry Rice Krispies and corn flakes, and 3 cups of tea) had worn off by then. I kept walking. My map showed a little park called Bedford Square, which looked to be right near the British Museum, so I figured that would be a good place to sit and have my little can of tuna and part of my apple for lunch before going to the museum. After lunch, I headed up the street (the wrong way, as it turns out), but it was serendipitous because I passed a blue (ceramic?) plaque on the front of a building, designating it the house in which the Pre-Raphaelite Brotherhood was founded in 1858. The painters and writers associated with this group created some beautiful work--and maybe I'll see some of it before I leave London! Directions from helpful pedestrians got me to the British Museum. Wow, what a place to spend some time. It's enormous, and the galleries lead from one to another to another. I'm sure if anything was paying any attention to me, they must have thought, "That poor deluded man," because I kept walking into galleries and just sighing or ohhing at what I saw before me. The museum is full of things I have seen in books decades ago. 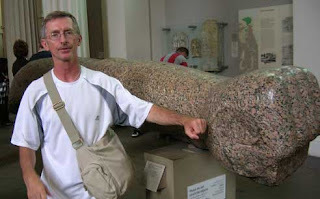 I decided to head first--not to Ancient Egypt, not to Ancient Greece--but to Ancient Iraq (Mesopotamia). And what should greet me in Mesopotamia but the piece popularly known as the Ram in the Thicket, inspired (I think) by the story of Abraham and the almost-sacrifice of Isaac, though this ram is not caught in the bushes, and is also probably a goat and not a ram. The goat is up on its hind legs with its front hooves in a tree, probably to eat leaves. It's made of gold, lapiz lazuli and shell and is probably a little older than the Great Pyramid. I took a photograph, but it's not terribly wonderful. Much of the material in the Museum is behind thick glass or polyurethane, and it can be a problem to avoid reflections and glare. And then there is the Gudea display! Seeing the Gudea material, right there with the Battle Standard and the Ram in the Thicket, was like seeing old friends. I learned about these objects when I was working on my Master's at UT in 1982 or possibly earlier. 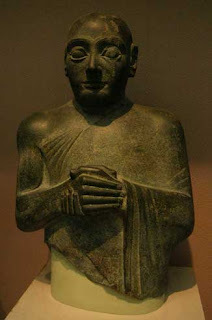 Gudea was the ruler of Lagash--I believe he was called ensi, if my memory serves me. He was not, as it were, the king of the city-state, but rather its ruler on behalf of the gods. This photo is of a statue from the city, though it is not identified as Gudea--it's the most perfect and lovely of the statues at the Museum. 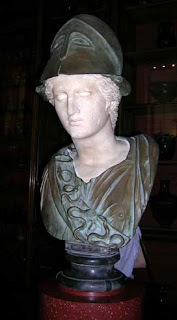 Another of the statues does have Gudea's name on it, but it's in such bad shape it wouldn't mean much to you. 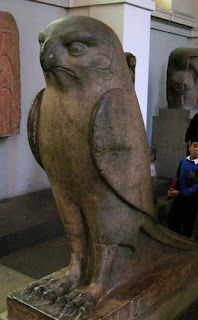 These statues from what is now southern Iraq, but was then Sumer, feature these large eyes, and robes worn over one shoulder, and folded hands, as if in reverence before the gods. Beautiful work. 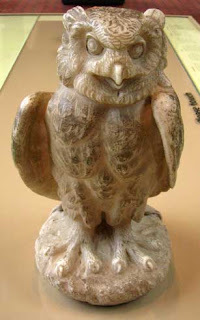 If the Ram and the Battle Standard are perhaps 4600 years old, these statues are a little younger, maybe 4100 years old. For comparison, by this time, Egypt's Old Kingdom (its pyramid age) had already declined and maybe even splintered into smaller semi-kingdoms before being reorganized by the kings of the 11th Dynasty. The earliest two dynasties of the unified Egypt are pretty sketchy. The traditional uniter of the earlier two nations is called Menes, but scholars aren't sure who he is. Maybe he is the same as a pharaoh called Narmer, but it's impossible to establish. Another of these earlier pharaohs is simply known as Scorpion to the Scorpion King, a name which will ring a bell for those of you who are fans of Mummy-related movies. Some of the art which survives from those days takes the form of palettes, more or less flat pieces of stone carved on both sides. This is called the Hunter's Palette. Two of the three pieces of this are real; and the third is a cast of the other piece, which is in the Louvre. When I first saw this, I thought, "Narmer!" 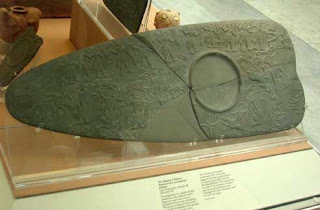 because perhaps the most famous of the palettes is Narmer's battle palette. But Narmer is not here. I don't know which museum has him--maybe the Egyptian Museum. The pharaoh of the Great Pyramid is sometimes called Cheops, a Greek version of his name. Khufu would be closer. And this stone has his name on it, in the box. Those of you who are fans of King Tut will recall the so-called cartouche, which pharaohs always wrote their names in later. 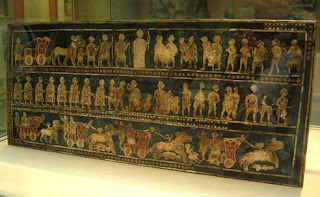 But in this earlier period, royal names are sometimes in these boxes (which may represent a house or a temple, I think). Khufu is 4th Dynasty, almost 4500 years ago. The explanatory plaque said the name as written here would be something like Medjedu. 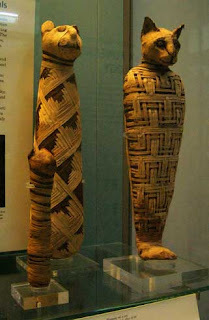 Here are three mummies, in one display case together, but they aren't human: these are cat mummies, and this photo is especially for my sister Teresa and my alphabetical friends Lou Ann, Sheila and Steve. The Egyptians weren't the only ones doing fancy burials, of course, though sometimes the others weren't doing it quite as well. These are coffin lids made by the Philistines. In books about ancient history, the Philistines are considered part of a large movement of various groups of people called "the Sea Peoples" more than 3000 years ago. Egypt had problems with various groups of them at one point, especially during the days of Ramesses III about 3200 years ago. 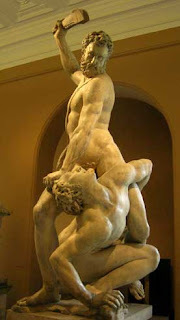 But most people, when they hear the word Philistine, think of the Biblical stories of Samson and of David and Goliath. 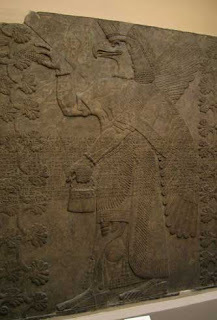 Coming forward several centuries here is a wall carving from Assyria (or is it Persia? I'm pretty sure it's Assyria). 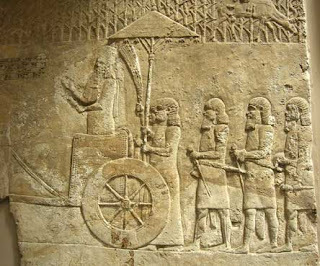 Assyria figures in the books of the kings in the Bible and had its homeland in what we would call Northern Iraq. This is some kind of spirit-creature or perhaps a minor deity or servant of the gods. If I remember correctly, scholars sometimes refer to these figures as cherubim. You can see the lines of cuneiform text running across the middle of the panel, right across the figure's body and the trees from which it is plucking something. 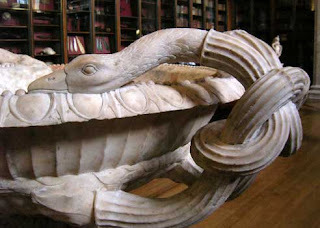 I also went fairly quickly through the Roman rooms, though I took a number of photos of both Greek and Roman materials. This is, I'm pretty sure, Roman, though I don't remember conclusively. It's the rim of a rather large bowl or basin--maybe 3 feet across--and I found it quite lovely. 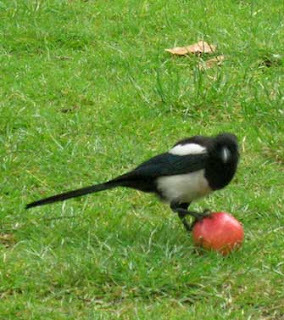 Notice how beautifully life-like the bird's neck and head are. 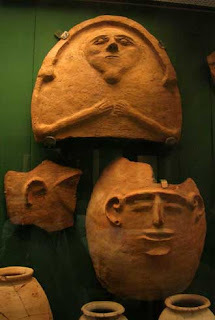 Well, we've been sort of moving from older to newer art in this little tour, but now let's go way back--Stone Age art. 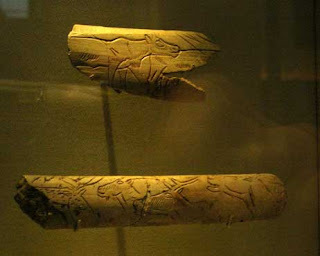 These are very small pieces, a few inches long each, and the plaque points out that they are not "useful". Much early art serves a purpose: the "art" is really a decorated tool. But these two are not tools, meaning that they may have been decorated just for the loveliness of doing it: art in our sense of the term. What skill the ancients had in depicting animals! And now you're thinking, "Wait a minute! How long has it been since he talked about food?" And you're right to be suspicious. I broke my visit in half by stopping in the main floor snack area and having a cup of Darjeeling tea and a packet of "potato crisps". Since I hadn't had any with lunch, it seemed appropriate to have some at the Museum. Fortunately I had bought AA batteries at Superdrug on my walk to the Museum. I took so many photographs that I wore out the first pair of batteries (the camera takes two at a time) before I got out of the Museum! For comparison, most of the pairs I had used up to this point lasted 5 to 7 days! 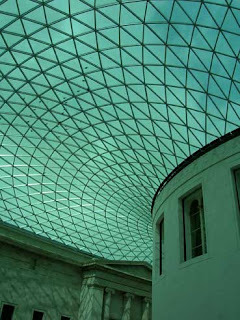 Visiting the British Museum can certainly make one wish one had gone into archaeology. What an amazing place it is. While I was at Starbuck's later this afternoon, working on email and the Travel Log, a bobby walked up to me and said something like, "Sir, while I am talking to you on this side, someone could be coming up on your other side and taking your bag from where you've got it hooked on the corner of the chair." And he advised me to put it in front of me and hook it around my leg to discourage attempted theft! I had felt like it was pretty safe because I looked down at it every few minutes, but he was right--two thieves working together could have deprived me of my new Debenham's bag. And when I was having my tea at the British Museum a guard there came up to a Spanish family across the table from me and told the woman, who had set her purse on the chair behind her, that a thief could easily take it without her knowing it--so the British authorities, even at the Museum, are keeping their eyes out for the safety of tourists! Nice, indeed. And then this evening, while I was showering, I had the window open both to let the room cool down a bit (it faces sort of west-ish) and to let the humid air of the shower out--and of course the first real rain we've had since I got here happened while I was showering, so the inside of the window was wet, the bottoms of the curtains were wet, the window-sill was wet, and the bed was even a bit wet! They only give you one towel at the hotel here, so I had to use the floor-towel (not really a floor-mat) to dry everything off! You can get your tan, you know, from standing in the English rain. I will try to do a better job of noticing this morning, but I believe the sky begins to lighten by about 4:30. Certainly the light woke me more than once before I actually got up. I just rolled over again and went back to sleep. I was tired. I had toast, tea and dry cereal for breakfast at the Springfield--and a full breakfast was offered me, but I had to turn it down. The Springfield certainly offers the most complete spread that I have seen since leaving the ship--egg, breakfast ham, baked beans, sausage (I believe the English say rasher; is that correct, Lou Ann? ), coffee, as well as what I had myself. Once again I spent most of the day on my feet. My metabolism seems to be racing from all the activity, so I told myself that I can have all the sugar I want in my tea, since my body will burn through it in just a few minutes anyway! 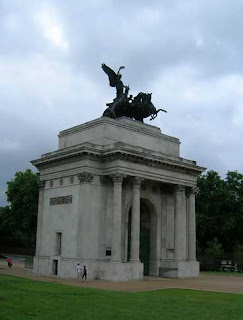 The park also contains a World War I memorial and an unusual multi-piece sculpture which must be in honor of the fallen soldiers of New Zealand. The individual pieces look more or less like steel girders, except they are +-shaped, instead of shaped like I-bars or T-bars, so that each bar, angling up from the ground, ends by displaying a cross to the viewer. The photo above shows the front of the Abbey, and that is the main entrance for services there. But the tourist entrance is off along the north side. At the moment, the museums in London which the government owns are free to the public (although the Conservatives have said they will change that policy if they regain power). But Westminster Abbey "receives no financial support from the State, the Crown or the Church," and the entrance fee is 10 pounds (about 20 dollars). But oh my, what a place! What a wonderful place. It is, to be sure, a beautiful building even if one knows nothing about English history and culture--the "sentimental" attachments that people have to the building. Its pillars and windows just soar up into the air enormously, making St John's Co-Cathedral in Valletta feel small by comparison. Its history goes back to 960 AD (says the brochure), and King Henry III began the "present church" in 1245. 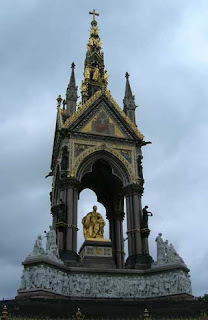 Many kings and queens and nobles are buried here, and many other famous English people are either buried here or have plaques or memorial stones here: Charles Darwin, Isaac Newton, Winston Churchill. But of course the "poet's corner" really drew me. Geoffrey Chaucer, who died in 1400, I believe, is buried here. And there are burial or memorial stones or plaques for Shakespeare, Wordsworth, Coleridge, Byron, Keats, Shelley, Dickens, Jane Austen, the Bronte sisters, Lewis Carroll, and--especially cool for me--Thomas Hardy. 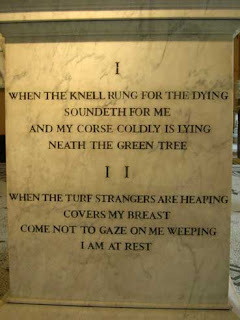 Hardy, I'm almost positive is not buried here, though his heart may be. I had to squat down and touch his small square stone on the floor. The Chapter House is a lovely chapel-ish building outside the main abbey with tiles on the floor going back to the 13th or 14th century and much faded paintings on some of the walls. The high stained glass windows are newer, replaced after being broken in World War II, though some of the pieces have been taken from 19th century windows. Several centuries ago, the Chapter House was the meeting place of the House of Commons, which must have had far fewer members in those days! Westminster Abbey was a grand place to begin my official "sightseeing" in London, and I look forward to going back next week when Susan arrives. After leaving the Abbey I took this photo of Big Ben which is just about a block away. 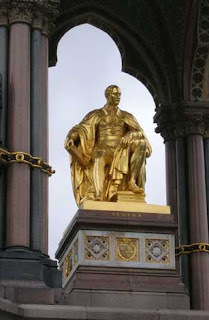 I had lunch--ham on wheat bread and a cup of tea--while sitting on a low ironwork fence in a tiny park behind the National Portrait Gallery, right near a statue in memory of Henry Irving, a prominent 19th century actor for whom the author Bram Stoker (Dracula) was business manager. 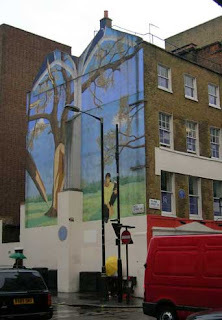 Then I roamed up Whitehall Road, which sort of turns into Charing Cross Road. I visited some used bookstores and then, as I neared Oxford Street which is supposed to be the, or one of the, premier shopping areas of London, some new bookstores. I visited Blackwell's, Borders, and an independent called Foyles. There I bought a novel in Spanish called Las puertas templarias by Javier Sierra, who also wrote La cena secreta (available in English as The Secret Supper), which I hope will be a fun read. It showered three or four times today as I was in and out, so the cheap umbrella I bought yesterday came in handy. At various times it was comfortably pleasant or just on the edge of chilly. I kept my windbreaker on all day. There was sun from time to time, but mostly it was cloudy. Then, this evening, just as I was nearing being finished with email and the Travel Log and elimae, a man asked if he could share the table I was at, because Starbuck's was crowded. I told him sure and that I was nearly finished, and then we chatted a bit as I got ready to go. 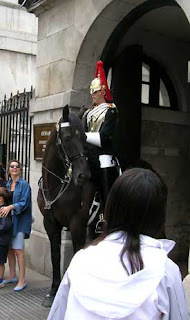 He said he lives nearby and that it's a really nice part of London, and he asked what part of the States I was from. There was another American at the next table, and he heard us talking and it turns out he is from Houston. He has been in India on business, then London, and returns to Houston tomorrow. There are a lot more Americans in London than in Malta! No surprise there, I reckon. Mrs Galea called me a bit before six this morning to make sure I got up on time to catch my flight to London. After fidgeting with and finalizing up my packing, and taking a quick shower, I went down for a cup of tea and a small loafette of bread which Mrs G prepared for me, even though breakfast isn't normally until 8. I left the Asti about 7 a.m. and walked to the Valletta bus terminus for the last time--this time around, at least. Waited for the bus. Took the long ride to the airport. Got there about 8, I guess. The plane left at 10. In between, I had a cup of tea, ate some cookies, did some reading. The flight was uneventful, about three hours long, although only two hours on the clock, since Malta is one hour minus Greenwich mean time. So it was about noon when we got to London. By the time I got through customs, got my luggage and got my train ticket to Victoria Station, it was about one. Two, Malta time. Since my early, small breakfast, I had had cookies and four little crackers with butter. I was almost so hungry that I wasn't hungry anymore. The train ride to Victoria Station took about 35 minutes. Fortunately I was able to sit and set my backpack down. It weighs about 11 kilograms, apparently--if I read the meter right at the airport. About 25 pounds maybe? It sure feels heavier on my shoulders. After disembarking at Victoria Station I had to get my first lessons on the London Underground, or "the Tube." An Underground employee was very helpful and practically led me by the hand to show me which subway line to take and how to buy a ticket. After I got to what I hoped was the right platform, I asked another bystander about what subway to catch and how to know which it was, and he told me everything I needed to know for right then. On the subway itself I had to stand for the first half of the ride, and then was able to get a seat and get the weight off my back. I was next to a young lady who also had a backpack, so I started up a conversation with her and found out that she is from Washington State and just arrived in London yesterday. She had attended the Solstice Festival at Stonehenge yesterday and loved it. (She's young, remember.) She said she has had about 6 hours of sleep since Monday. Yikes! From Paddington Station, my stop, it was pretty easy to find the hotel. I had the map that Air Malta had given me of Central London and it was quite helpful. But it is also true that people were very helpful and ready to assist an ignorant Texan. The Springfield is on Sussex Gardens Road, which sort of arcs off Lancaster Terrace, a tiny little connector to Bayswater Road which skirts both Kensington Gardens and Hyde Park on their north sides. So this is really a pretty cool part of town. The block the Springfield is on is pretty much nothing but hotels. They look like a solid block of buildings, much like in Malta, but once I was inside my room (up on the fourth floor above ground again!) I could see that there is empty space behind those solid facades. I look out toward another hotel block but there are lower buildings between and below us, so it's not like staring at a wall three feet away. There is open air. The hotel directly beyond the Springfield, toward the east, is called Days Hotel, and--judging by its logo--it's a version of Days Inn. Anyway, by the time I did all my train maneuvering and walking (not that far) to the hotel, and getting checked into the hotel (a bit complicated since I will have to change rooms once, and maybe twice, because of making the late booking for these early 6 days), and getting to the room and unloading a bit, I guess it was 2:30. So I went out to see if I could find a grocery store that had enough food to help me, and maybe find a wifi spot as well. I wandered toward where I thought the deskman told me, but either I didn't wander correctly, or he didn't understand my idea of a supermarket, because I didn't find anything that looked like it would be much help. More wandering, and more asking of residents for help, got me to Marks & Spencer. Now in Malta, M&S was clothes--here it's grocery and clothes, which strikes me as an odd combination. It didn't help me as much as I had hoped--I didn't, for example, find pop-top or plastic-packet tuna, or small bottles or cans of V8--but I found deli ham, turkey and chicken (today I went with ham), "quick" oatmeal (aka "porridge"), a bagel, some potato snackish things, some apples, and some bottled water. After checking out at M&S, I headed down the street on the way back to the hotel, got a little lost, asked more directions, bought an umbrella (it's already rained lightly since I arrived, as well as been sunny and cloudy), and then went to Kensington Gardens to sit on a bench and have my very late lunch. 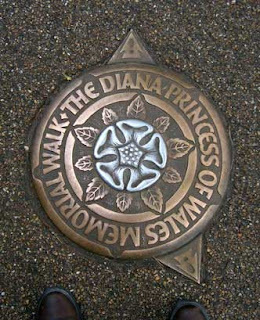 After taking the Peter Pan photos I wandered on farther south (despite my hankering for Starbuck's) because I had noted a pointer sign reading "Diana Princess of Wales Memorial Fountain", and I knew I should get a picture of that for my friend Nancy Bass. Now Nancy has been to England many times, but I don't believe she has been since this fountain will have been created. I had to walk and walk quite a way before I finally reached it. It's not actually a fountain, in any ordinary sense. Rather it's a sort of lopsided oval, on a slightly sloping field, where the water flows around and around, to all appearances going uphill at one point! This photo shows the spot where the "bed", if you will, is broken up to make a kind of small rapids. 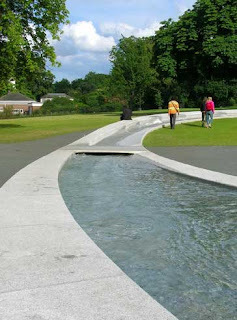 And this one shows the fountain arcing on around from "below" (should I say downstream?) the rapids. And yes, those are the tips of my Big Boy shoes at the bottom of the photo. After taking this photo, I headed out on my search for tea and wifi. Finding a location, I ordered tea and a shortbread cookie, and sat down to wifi. I bought a one-month unlimited usage plan (unlimited usage, that is, in the UK--it will do me no good on the bus tour in Ireland) from T-Mobile for 40 pounds--$80. About what I paid in Malta, and about twice what one would paid for a similar plan (that is, not attached to a mobile phone account) in the US. Likewise the tea "posting" on the menu board says the same thing for a venti (large) tea as in the US, that is, 1.75, but in the US, that's $1.75, but in the UK it's 1.75 pounds, which is twice as much. The UK is expensive, not just for tourists. I spent an hour and a half, or two hours, catching up on email, posting the last full day Malta travel log entry, and checking what my next credit card payment will be. Oddly, though this payment isn't due until mid-July, it covers charges that go all the way back to my onboard charges on the cruise ship! I didn't tell you about the room, did I? It's small. The Springfield has 18 rooms (at least the highest number I've seen is 18), and there are smaller and larger rooms. I am in a smaller room, a room for one. It has a twin bed, a chair, a tiny bedside table, a little shelf for the tea fixings, a very small closet, and a bathroom--all of which is squeezed into maybe 80 square feet. It really is probably roughly the same size as my little Casita travel trailer--it may even be a bit smaller. But it has an actual shower stall, not simply a lower place in the floor; it has a television with programming in English (whether it's interesting or not, I can at least understand what's being said); and it has tea fixings. You will laugh to know that I used those fixings--the water pot, the cup, the spoon, the sugar--along with the oats I bought at M&S to make myself a cup of oatmeal for supper. I didn't have any this morning (because I used my last packet yesterday), and I didn't have the energy to get out for supper, so I had oatmeal in. Ah, the life of the idle. And after I finished the oatmeal, I rinsed out the cup so I could have an evening cup of tea. It is 10:23, and the sky is not yet completely dark. The northern summer days last a long time. It's cool to be in London. I haven't seen anything terribly exciting yet--except Kensington Gardens--but it feels cool to be here. It really does.